What’s the Right Haircut for Your Face? Think about the most beautiful people you know or the most beautiful celebrities you’ve seen. If you line up their photos and look at their features one at a time, chances are you’ll notice that as beautiful as they all are, they’re also all very different. That goes to show that beauty is not about a single feature, or even a set of features, but it’s about making the most of the features you have. And the right haircut does exactly that. Take a look below at how to choose the right haircut for your face. Achieving the right haircut is all about creating harmony between your hair and your face. The most flattering haircuts will balance out your features to highlight your beauty. Most faces fall into one of six distinct face shapes. Some are combinations of more than one. For example, you can have a long square shape or a round square shape. No matter what shape your face is, there is a wide range of hairstyles, colors, and cuts that will look great on you. Below, we break down the different shapes and offer some style ideas and celebrity inspiration. The forehead is slightly wider than the chin. The length of the face is approximately one and a half times the width. Oval faces can rock just about any style. Shoulder length with center part; long, with blunt bangs; shaggy pixie; loose soft curls and side-swept bangs. Jessica Alba, Salma Hayek, Beyoncé. Round faces have width and length that are approximately the same. Their cheeks are prominent, and they have no sharp angles. The best hairstyles for round faces will have layers or draw the eye either up toward the crown or down toward the shoulders provide some elongation. Long and layered; loose curls; shaggy bob; faux hawk; voluminous waves; updos with height or volume at the crown. Drew Barrymore, Ginnifer Goodwin, Mila Kunis. The forehead and jawline are approximately the same width. The jaw is strong and the chin is square. Hairstyles with soft multi-length layers will help balance out the sharp angles of square faces. Shoulder length layers; short fringe with front layers; angled bob; curly and voluminous. Rihanna, Lady Gaga, Lucy Liu. The oblong face is longer and narrower than the oval face. Curls, waves, and volume help to balance the narrowness by providing width. Long, loose waves; thick bangs; short bob; side ponytail; classic, wavy long bob. Meryl Streep, Iman, Angelina Jolie. The forehead and cheekbones are wider, and the chin and jawline are narrower. Flattering hairstyles for heart-shaped faces will balance out the narrow width of the bottom half of the face. Soft, side-swept bangs; long bob; loose waves; sleek crop; face-framing layers. Halle Berry, Reese Witherspoon, Scarlett Johansson. The forehead and jawline are both narrow, while the cheekbones are prominent and slightly wider. The best hairstyles for diamond shape faces will provide volume at the temples or the chin to give width to the jawline or the forehead. Chin-length bob; deep side part; tousled waves; lots of layers. Tyra Banks, Ashley Greene, Meg Ryan. 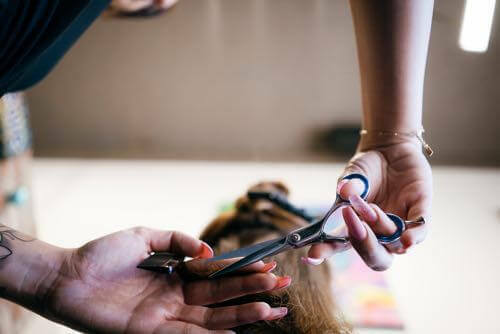 Ready for a custom cut and color that flatters your features? At The Electric Chair, we know how important it is to be true to yourself and to express your uniqueness. So, trust us when we tell you that just because we give you a haircut that flatters your face shape, it doesn’t mean you’ll look like anybody else. When you come into the salon, we’ll start with a great shape and customize it to match your style so that you leave looking like the best version of you. Come in for a consultation today, or give us a call at (619) 223-1112.